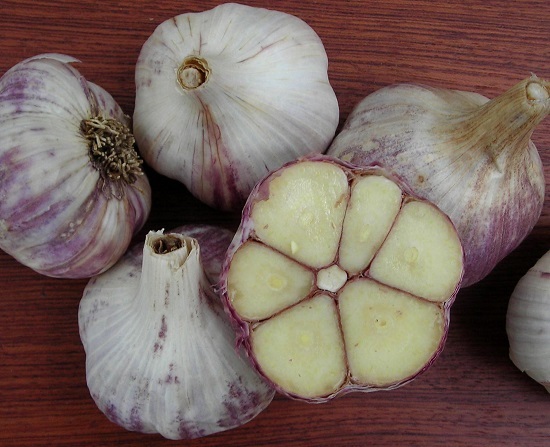 Alliums for July: harvest minor alliums, finish harvesting bulb onions, snip and sort garlic and bulb onions. In Virginia, July is not a big month for planting alliums. 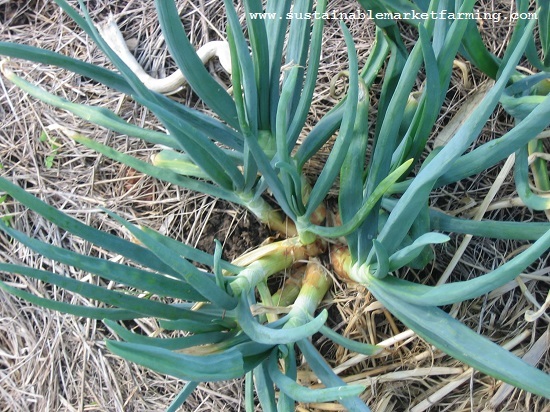 If you have perennial leeks or Egyptian onions you could if necessary divide clumps and replant them. But I would postpone doing this if I could and replant dry bulbs in August, or divide newly re-sprouting clumps in September. In June I listed dates of our usual allium harvests for that month. Some of the minor allium crops (shallots, leaves of perennial alliums) can be harvested in July, but some, like the tiny, purple shallot-like L’itoi perennial onion (Allium cepa var. aggregatum ) die back in June and are sending up new green shoots by early July, so you’ll have to wait for those to be big enough to harvest. During dormancy you could divide the clumps and replant. Harvests of full-sized bulb onions and cipollini (small bulb onions) continue through July. I discovered our bulb onion (A. cepa var. cepa) harvest dates had ranged more widely than the 6/15-6/30 I reported last month. 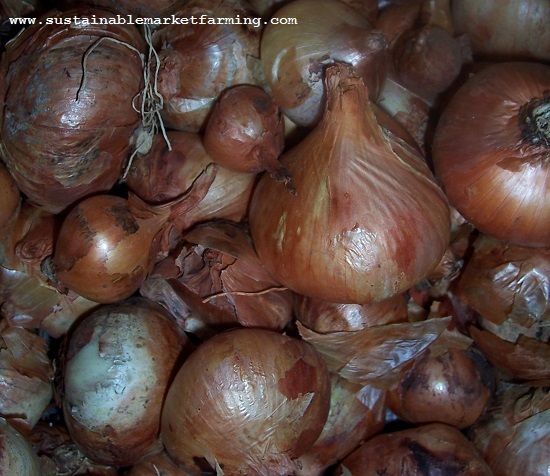 In the years 2008-2012, we harvested bulb onions 6/4–7/26, depending on the variety and the weather. In October I’ll write more about choosing onion varieties for your area. Bulb onions curing on a rack. Some books recommend curing in the outdoor sun. These books are written further north or further south! This doesn’t work in our climate, where we need to provide partial shade, moderate temperatures, and good air flow (and no rain). Further north, temperatures are lower, and onions do not bake during outdoor curing. Further south (in Georgia for instance) onions mature much earlier in the year (they have been growing over the winter). The sun is not yet too intense or the humidity too high, and they can cure onions in the field there. 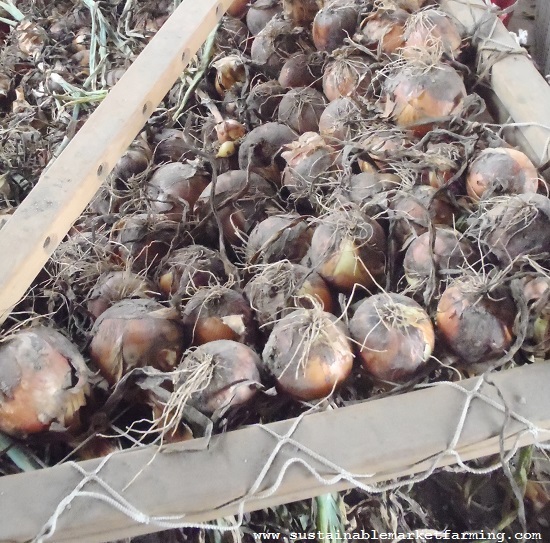 Handle onions gently – many rots are the result of poor handling post-harvest. Spread in a single layer in a warm dry place, and check every few days. The ideal conditions are 85ºF-90ºF (27ºC-32ºC) with constant air movement, no direct strong sunlight. We use racks in a barn, with fans to keep the air moving. Trimming should begin about two weeks after you hung the onions to cure. Test them by feeling maybe a dozen necks to see if they are ready. Pinch the necks gently just above the bulb, and then rub your thumb and forefinger together. They are ready for trimming if the majority of the necks feel dry and papery. The necks should not feel slippery or moist. If more than one or two still feel damp, but not slippery, wait a couple of days before testing again. Do not wait more than three weeks after harvest to get the onions in storage. The longer you leave the onions hanging, the more rot you will have to deal with. To trim get a good pair of scissors, and a glove on your scissor hand to prevent blisters. Trim the necks off about ½” (1 cm) from the bulb, and trim all the roots off. When trimming, sort the onions into three categories. Onions with wet necks or soft spots are for immediate use at home. Bulbs that feel firm and have dry necks are storage bulbs, and should be trimmed and put into mesh bags, which we store lying flat on shelves in our basement. Most onions store reasona­bly well if spread in a layer less than 4″ deep or hung from the ceiling in small mesh bags. Avoid large bags where the weight of the onions will crush the ones at the bottom. Ensure good air circulation. The third category is for bulbs that aren’t obviously use first, but for some reason might not store for months. Maybe the necks have a spongy feeling, or the skin is split, or the necks slip a little bit. Label these onions “Use Soon,” trim them into mesh bags and put them in the basement like the storage onions. 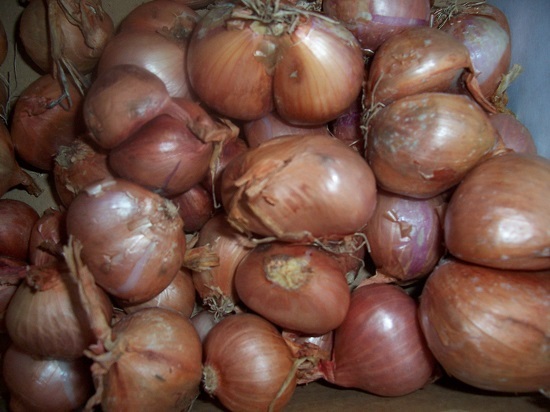 Onions can be stored at 60ºF-90°F (16ºC-32°C) if they have never been refrigerated. It is important to avoid the 45ºF-55°F (7ºC-13°C) range, because that’s when they sprout. We have limited refrigerated storage, so we keep alliums in the warmer storage range until room temperatures drop into the danger zone, by which time there is space in the cooler. More about onion storage in August. Pull the onions out of the ground, clean off some damaged leaf parts, taking care not to remove too many of the outer layers. Cut off the tops immediately, 2-4″ (5-10 cm) above the crown. If for long-term storage, bring the onions to the greenhouse for curing. Cover the greenhouse with 80% shade cloth to protect onions from sunscald. 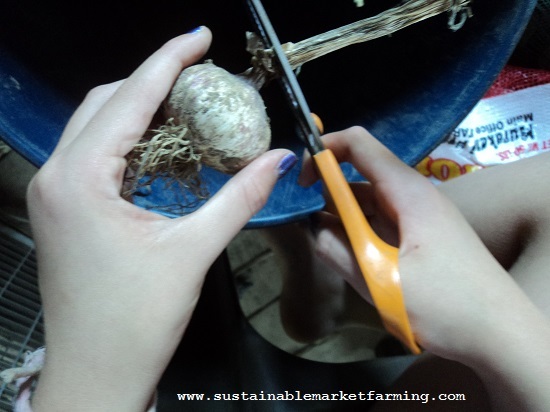 As soon as the necks are sufficiently dried up (you can no longer roll any stems between your fingers and the stem tissue feels like paper), and the leaves easily crumble off, give them a superficial cleaning, and move the onions into the barn (and not in the cooler due to high moisture levels). Store at 32ºF-41°F (0-5°C) 65-70% humidity. Pull the 3-4″ diameter onions out, before any leaves die, by grabbing the plants as low as possible on the stem to avoid crushing the green stems. Place the onions on the top of the bed all facing the same way. Clean off the outer leaves around the bulb to leave a clean white bulb. Bunch 2-4 onions together with twisties. Cut the excess length off the leaves so the bunch fits lengthwise in the box. Pick up the finished bunches, and place them in the box. Washing onions would shorten their storage life. Remove most of the dirt in the field. Bunched fresh onions look much nicer when clean. Spray off the onions with a hose but do not dump them into a washing tub. Pack in closed containers for storage longer than a week. Store at 32-41°F (0-5°C), 95-100% humidity. Cipollini (A. cepa var. 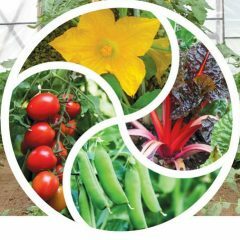 cepa) will be ready to harvest from spring transplants here in the first half of July, if they weren’t ready in late June. We sow those in plug flats 1/25 and transplant 3/21. Read more about cipollini in the June post. We love Red Marble, which stores really well. Purplette disappointed us – it doesn’t store well. Shallots (A. cepa var. aggregatum) grown from seed started in late January and transplanted in March will mature here 7/4 -7/30, 4-8 weeks later than those grown from replanted bulbs (planted in October). We started with a packet of seeds, replanting all we grew for several years. We got lots of winter-kill trying to over-winter the bulbs in the ground. To save bulbs for replanting in early spring, refrigerate them. And accept a later harvest than the 6/10 of fall-planted bulbs. Top-setting onions (aka Egyptian onions, tree onions, walking onions) produce tiny red-purple bulbs in the umbel instead of flowers, maturing in September. They were previously named Allium cepa var. proliferum. According to Wikipedia, they are now known to be a hybrid of A. cepa and A. fistulosum. The larger bulbils can be harvested in July, and used to make mixed pickles. Trimming garlic stems (blue nail polish optional!). Sort potato onions – see the first step of this process described in my June post and the harvesting described in my May post. We made slatted racks 5′ by 2.5′ (150 x 75 cm) which stack on each other leaving space for air. Curing is important for quality and long-term storage. Space the bulbs loosely on the racks to provide good air circulation. If humidity is high, use fans, dehumidifiers or an air conditioned room, to improve drying. Curing takes 2 to 4 weeks. I aim to sort through our potato onions once a month, starting a few weeks after harvest. 7/10-7/15: This could be the second sorting for fall-planted potato onions, the first sorting for late winter planted ones. Keep the clusters together, as breaking them apart stimulates sprouting. Wait till the third sorting, in early August, to snip off tops, separate the clusters, sort by size and decide how many to save for replanting. I’ll tell you about that next month. Remove any rotting onions for immediate use or composting. Start sorting with the largest ones, in case you run out of time. Remove all that are bigger than 2″ (5 cm), bag, weigh, record and label. If you are on a fast track to increase your crop, refrigerate all the large onions at this time, carefully labeled so they don’t get eaten, to plant in September. Refrigerate or plant them, or eat them, the large ones won’t keep long. Potato onions in early spring, after they have divided into a cluster.